Can anyone think of a better way to spend an entire Saturday besides a triple-header starting with the Montreal Canadiens and the Buffalo Sabres? Go ahead I’ll wait. Yeah I could not think of any either. So for Buffalo they come into Montreal looking to build off their decisive 7-4 victory over the Boston Bruins. As for Montreal their task was to bounce back from a humbling 5-1 defeat by the Ottawa Senators and the Canadiens managed to do just that with a decisive victory of their own this afternoon. Today’s game also marked the return of rearguard P.K Subban who missed the first six games of the campaign while negotiating a new contract. I think it is safe to say Habs fans everywhere are just thankful he is back where he belongs and looking forward to seeing him back in action. Late goals will kill you and no one knew that better than the 2011-12 Montreal Canadiens. What better way to kill the pain than to turn the tables? With eight seconds remaining in the opening frame Rene Bourque tipped in his second of the season on the power play to get the ball rolling for Montreal. Assists credited to Gionta (2) and Plekanec (2). Hoping to get back on their feet in the second period Buffalo would find themselves back on their heels instead with the kids once again showing they belong with the big club as Brendan Gallagher potted his third from Galchenyuk (5) and “newcomer” Francis Bouillon (3). What seemed to be a reoccurring theme this season the Habs built a two goal lead early would continue to build on their lead as the period wore on. At the 10:08 mark David Desharnais, who has been snake bitten early on this season, managed to snipe home his first of the season while on a three-on-one giving Montreal a 3-0 lead. Lars Eller, who has been struggling all year offensively, notched his first point of the season with an assist on the play. 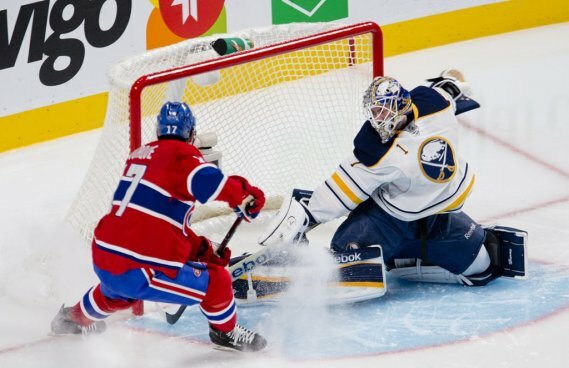 Just 28 seconds later Eller would get on the score sheet once again scoring his first goal of the campaign by driving towards the night on the right wing and just sliding it between the legs of Ryan Miller, 4-0 Montreal. It was not that long ago when the Habs were down several goals and we all witnessed the lack of energy and emotion that was displayed. This afternoon Montreal put them in a situation to not only be on the other side of the coin but also take advantage of every opportunity that came their way. I mentioned once before when the bounces go your way they continue to do so long-term and unfortunately that goes both ways and today all of the bounces went Montreal’s way. The trend continued in the third period with yet another offensive rush with Tomas Plekanec dishing a perfect saucer pass to Rene Bourque who skated hard to get into position and redirected the puck past Jonas Enroth who took over for Ryan Miller after the second period. Once again Montreal scored early with the goal coming at the 1:22 mark. Now up 5-0 the Bell Centre faithful began to sing their team’s praises breaking out into yet another chant of “ole ole ole”. I sometimes cringe seeing that up and down my twitter feed even with just a one goal lead however at this stage of the game I felt compelled to join in. Buffalo would silent the crowd once with Thomas Vanek’s team leading seventh goal while shorthanded. Another one of Montreal’s filthy habits of last season that still need to be ironed out and I believe coach Therrien will find a way to do so. Montreal would capitalize one more time on the man advantage with once again David Desharnais finding the back of the net for his second of the game from Eller (2) and Subban (1). Although the final nail in the coffin had already been driven in this was just salt in the wounds. In regards to Subban he was not his usual explosive self what he was indeed effective and at the end of the day that is all that matters. His energetic and physical style of play will once again resurface but until then Subban has to work on reintegrating himself into Montreal’s style of play. After gaining a big two points this afternoon up next is the Ottawa Senators who already possess a win over the Canadiens earlier in the week. Will Montreal stick with the same lineup? Coach Therrien will probably want to do so and if the energy level will be the same why not really? Each line showed intensity and confidence which is something the Canadiens have been known for in the past. It is about time we see that on a consistent basis. Nice to get the W! GO Habs go! Aw, this was a very good post. Finding the time and actual effort to create a really good article… but what can I say… I procrastinate a lot and don’t seem to get anything done.